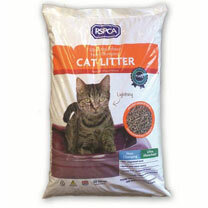 Our RSPCA non clumping cat litter has been sourced by animal experts to provide a dust free eco-friendly solution for your cats’ and kittens’ litter trays. The wood pellets provide complete absorbency and are sourced from FSC certified UK forests. Available in both 10 litre and 30 litre bags.